Like its MOLLE-version cousin, the Belt-Mounted Multi-Access Comm (MAC) TACO® Pouch by High Speed Gear offers an impressive, low-profile carrier for a variety of military communication devices. The pouch is crafted from High Speed Gear's tough, military-grade webbing and offers a secure grip on valuable communications gear. The open top as well as 2.5-inch side openings guarantee ease of access to radio controls without having to remove the device itself. 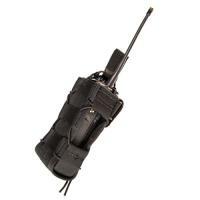 Easily mount the Multi-Access Comm on belts up to 2-inches wide using the Velcro® One-Wrap® attachment system.